Over time, software evolves and it is important to stay up to date if you want to benefit from new features and performance improvements. Database engines follow the exact same logic and providers are always careful to provide an easy upgrade path. With MySQL, the mysql_upgrade tool serves that purpose. A database upgrade process becomes more challenging in a managed environment like AWS RDS where you don’t have shell access to the database host and don’t have access to the SUPER MySQL privilege. This post is a collaboration between Fattmerchant and Percona following an engagement focused on the upgrade of the Fattmerchant database from Amazon Aurora MySQL 5.6 to Amazon Aurora MySQL 5.7. Jacques Fu, the CTO of Fattmerchant, is the co-author of this post. Our initial plan was to follow a path laid out previously by others but we had difficulties finding any complete and detailed procedure outlining the steps. At least, with this post, there is now one. If the new server was temporary, you’ll need to repeat most of the steps the other way around, this time starting from the new server and ending on the old one. What we thought would be a simple task turned out to be much more complicated. We were preparing to upgrade our database from Amazon Aurora MySQL 5.6 to 5.7 when we discovered that there was no option for an in-place upgrade. Unlike a standard AWS RDS MySQL (RDS MySQL upgrade 5.6 to 5.7) at the time of this article you cannot perform an in-place upgrade or even restore a backup across the major versions of Amazon Aurora MySQL. We initially chose Amazon Aurora for the benefits of the tuning work that AWS provided out of the box, but we realized with any set of pros there comes a list of cons. In this case, the limitations meant that something that should have been straightforward took us off the documented path. Even those simple steps proved to be challenging. First, the Amazon Aurora MySQL 5.6 write node must generate binary log files. The default cluster parameter group that is generated when creating an Amazon Aurora instance does not enable these settings. Our 5.6 write node was not generating binary log files, so we copied the default cluster parameter group to a new “replication” parameter group and changed the “binlog_format” variable to MIXED. The parameter is only effective after a reboot, so overnight we rebooted the node. That was a first short downtime. of mysqldump implies “Flush table with read lock;” while the replication coordinates are read from the server. A “Flush table” requires the SUPER privilege and this privilege is not available in RDS. The schema consist of three databases: db1, db2 and db3. We have not included the mysql schema because it will cause issues with the new 5.7 instance. You’ll see why we dumped the schema and the data separately in the next section. The endpoint mydbcluster.cluster-123456789012.us-east-1.rds.amazonaws.com points to the Amazon Aurora MySQL 5.6 production cluster. Now, if everything went well, the new Amazon Aurora MySQL 5.7 cluster will be actively syncing with its master, the current Amazon Aurora MySQL 5.6 production cluster. This process can take a significant amount of time depending on the write load and the type of instance used for the new cluster. You can monitor the progress with the show slave status\G command, the Seconds_Behind_Master will tell you how far behind in seconds the new cluster is compared to the old one. It is not a measurement of how long it will take to resync. You can also monitor throughput using the AWS console. In this screenshot you can see the replication speeding up over time before it peaks when it is completed. At this point, we have an Amazon Aurora MySQL 5.7 cluster in sync with the production Amazon Aurora MySQL 5.6 cluster. Before transferring the production load to the new cluster, you need to test your application with MySQL 5.7. The easiest way is to snapshot the new Amazon Aurora MySQL 5.7 cluster and, using the snapshot, provision a staging Amazon Aurora MySQL 5.7 cluster. Test your application against the staging cluster and, once tested, destroy the staging cluster and any unneeded snapshots. The application is down from steps 2 to 8. Although that might appear to be a long time, these steps can easily be executed within a few minutes. So, in summary, although RDS Aurora doesn’t support an in place upgrade between Amazon Aurora MySQL 5.6 and 5.7, there is a possible migration path, minimizing downtime. In our case, we were able to limit the downtime to only a few minutes. Jacques is CTO and co-founder at the fintech startup Fattmerchant, author of Time Hacks, and co-founder of the Orlando Devs, the largest developer meetup in Orlando. He has a passion for building products, bringing them to market, and scaling them. Parallel query execution is my favorite, non-existent, feature in MySQL. In all versions of MySQL – at least at the time of writing – when you run a single query it will run in one thread, effectively utilizing one CPU core only. Multiple queries run at the same time will be using different threads and will utilize more than one CPU core. 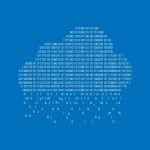 On multi-core machines – which is the majority of the hardware nowadays – and in the cloud, we have multiple cores available for use. With faster disks (i.e. SSD) we can’t utilize the full potential of IOPS with just one thread. AWS Aurora (based on MySQL 5.6) now has a version which will support parallelism for SELECT queries (utilizing the read capacity of storage nodes underneath the Aurora cluster). In this article, we will look at how this can improve the reporting/analytical query performance in MySQL. I will compare AWS Aurora with MySQL (Percona Server) 5.6 running on an EC2 instance of the same class. Aurora Parallel Query response time (for queries which can not use indexes) can be 5x-10x better compared to the non-parallel fully cached operations. This is a significant improvement for the slow queries. As I want to maximize the concurrency of parallel query sessions, I have chosen db.r4.8xlarge. For the EC2 instance I will use the same class: r4.8xlarge. I’m using the “Airlines On-Time Performance” database from http://www.transtats.bts.gov/DL_SelectFields.asp?Table_ID=236&DB_Short_Name=On-Time (You can find the scripts I used here: https://github.com/Percona-Lab/ontime-airline-performance). The table is very wide, 84 columns. Aurora PQ works by doing a full table scan (parallel reads are done on the storage level). The InnoDB buffer pool is not used when Parallel Query is utilized. The EXPLAIN plan in MySQL will also show the details about parallel query execution statistics. Let’s take a look at the most simple query: count(*). This variant of the “ontime” table has no secondary indexes. Please note: the first run was “cold run”; data was read from disk. The second and third run used the cached data. (from the EXPLAIN plan, we can see that parallel query is used). As we can see the results are very stable. It does not use any cache (ie: innodb buffer pool) either. The result is also interesting: utilizing multiple threads (up to 16 threads) and reading data from disk (using disk cache, probably) can be ~10x faster compared to reading from memory in a single thread. Here we can see that PQ gives use ~2x performance increase. Select count(*), not using index: 10x performance increase with Aurora PQ. 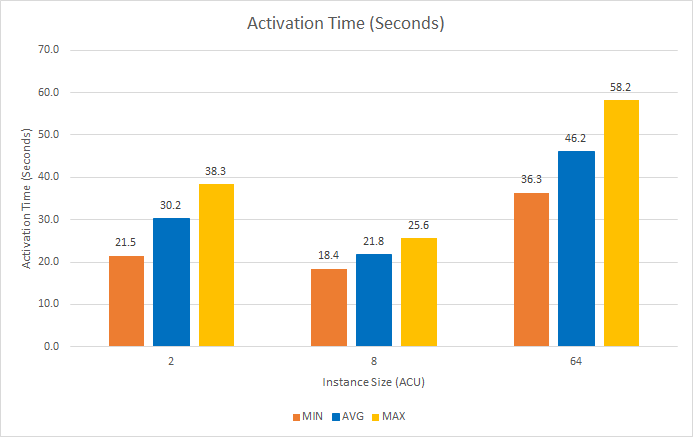 select avg(…), not using index: 2x performance increase with Aurora PQ. The following query will always be slow in MySQL. This combination of the filters in the WHERE condition makes it extremely hard to prepare a good set of indexes to make this query faster. Let’s compare the query performance with and without PQ. As we can see, Aurora PQ is almost NOT utilizing the buffer pool (there are a minor number of read requests. Compare the max of 4K requests per second with PQ to the constant 600K requests per second in the previous graph). As we can see, Aurora does not use any indexes and uses a parallel scan instead. 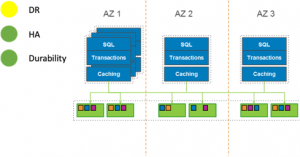 Aurora PQ can significantly improve the performance of reporting queries as such queries may be extremely hard to optimize in MySQL, even when using indexes. 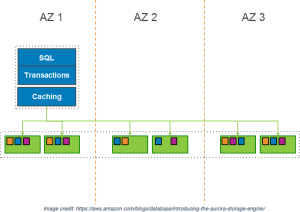 With indexes, Aurora PQ response time can be 5x-10x better compared to the non-parallel, fully cached operations. Aurora PQ can help improve performance of complex queries by performing parallel reads. It’s a few weeks after AWS re:Invent 2018 and my head is still spinning from all of the information released at this year’s conference. This year I was able to enjoy a few sessions focused on Aurora deep dives. In fact, I walked away from the conference realizing that my own understanding of High Availability (HA), Disaster Recovery (DR), and Durability in Aurora had been off for quite a while. Consequently, I decided to put this blog out there, both to collect the ideas in one place for myself, and to share them in general. Unlike some of our previous blogs, I’m not focused on analyzing Aurora performance or examining the architecture behind Aurora. Instead, I want to focus on how HA, DR, and Durability are defined and implemented within the Aurora ecosystem. We’ll get just deep enough into the weeds to be able to examine these capabilities alone. 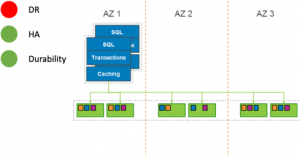 Aurora MySQL – What is it? We’ll start with a simplified discussion of what Aurora is from a very high level. 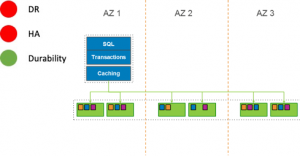 In its simplest description, Aurora MySQL is made up of a MySQL-compatible compute layer and a multi-AZ (multi availability zone) storage layer. In the context of an HA discussion, it is important to start at this level, so we understand the redundancy that is built into the platform versus what is optional, or configurable. The Aurora Storage layer presents a volume to the compute layer. This volume is built out in 10GB increments called protection groups. Each protection group is built from six storage nodes, two from each of three availability zones (AZs). These are represented in the diagram above in green. When the compute layer—represented in blue—sends a write I/O to the storage layer, the data gets replicated six times across three AZs. In addition to the six-way replication, Aurora employs a 4-of-6 quorum for all write operations. This means that for each commit that happens at the database compute layer, the database node waits until it receives write acknowledgment from at least four out of six storage nodes. By receiving acknowledgment from four storage nodes, we know that the write has been saved in at least two AZs. The storage layer itself has intelligence built-in to ensure that each of the six storage nodes has a copy of the data. This does not require any interaction with the compute tier. By ensuring that there are always at least four copies of data, across at least two datacenters (AZs), and ensuring that the storage nodes are self-healing and always maintain six copies, it can be said that the Aurora Storage platform has the characteristic of Durable by Default. The Aurora storage architecture is the same no matter how large or small your Aurora compute architecture is. One might think that waiting to receive four acknowledgments represents a lot of I/O time and is therefore an expensive write operation. However, Aurora database nodes do not behave the way a typical MySQL database instance would. Some of the round-trip execution time is mitigated by the way in which Aurora MySQL nodes write transactions to disk. For more information on exactly how this works, check out Amazon Senior Engineering Manager, Kamal Gupta’s deep-dive into Aurora MySQL from AWS re:Invent 2018. While durability can be said to be a default characteristic to the platform, HA and DR are configurable capabilities. Let’s take a look at some of the HA and DR options available. Aurora databases are deployed as members of an Aurora DB Cluster. The cluster configuration is fairly flexible. Database nodes are given the roles of either Writer or Reader. In most cases, there will only be one Writer node. The Reader nodes are known as Aurora Replicas. 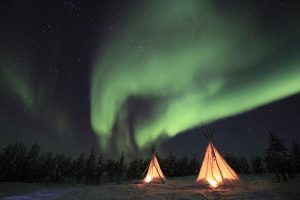 A single Aurora Cluster may contain up to 15 Aurora Replicas. We’ll discuss a few common configurations and the associated levels of HA and DR which they provide. This is only a sample of possible configurations: it is not meant to represent an exhaustive list of the possible configuration options available on the Aurora platform. The most basic implementation of Aurora is a single compute instance in a single availability zone. The compute instance is monitored by the Aurora Cluster service and will be restarted if the database instance or compute VM has a failure. In this architecture, there is no redundancy at the compute level. Therefore, there is no database level HA or DR. The storage tier provides the same high level of durability described in the sections above. The image below is a view of what this configuration looks like in the AWS Console. 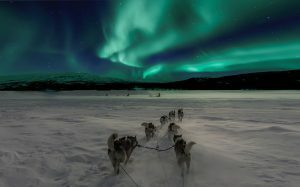 HA can be added to a basic Aurora implementation by adding an Aurora Replica. We increase our HA level by adding Aurora Replicas within the same AZ. If desired, the Aurora Replicas can be used to also service some of the read traffic for the Aurora Cluster. This configuration cannot be said to provide DR because there are no database nodes outside the single datacenter or AZ. If that datacenter were to fail, then database availability would be lost until it was manually restored in another datacenter (AZ). It’s important to note that while Aurora has a lot of built-in automation, you will only benefit from that automation if your base configuration facilitates a path for the automation to follow. 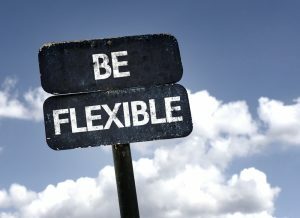 If you have a single-AZ base deployment, then you will not have the benefit of automated Multi-AZ availability. However, as in the previous case, durability remains the same. Again, durability is a characteristic of the storage layer. The image below is a view of what this configuration looks like in the AWS Console. Note that the Writer and Reader are in the same AZ. Building on our previous example, we can increase our level of HA and add partial DR capabilities to the configuration by adding more Aurora Replicas. At this point we will add one additional replica in the same AZ, bringing the local AZ replica count to three database instances. We will also add one replica in each of the two remaining regional AZs. Aurora provides the option to configure automated failover priority for the Aurora Replicas. Choosing your failover priority is best defined by the individual business needs. That said, one way to define the priority might be to set the first failover to the local-AZ replicas, and subsequent failover priority to the replicas in the other AZs. It is important to remember that AZs within a region are physical datacenters located within the same metro area. This configuration will provide protection for a disaster localized to the datacenter. It will not, however, provide protection for a city-wide disaster. The image below is a view of what this configuration looks like in the AWS Console. Note that we now have two Readers in the same AZ as the Writer and two Readers in two other AZs. The three configuration types we’ve discussed up to this point represent configuration options available within an AZ or metro area. There are also options available for cross-region replication in the form of both logical and physical replication. 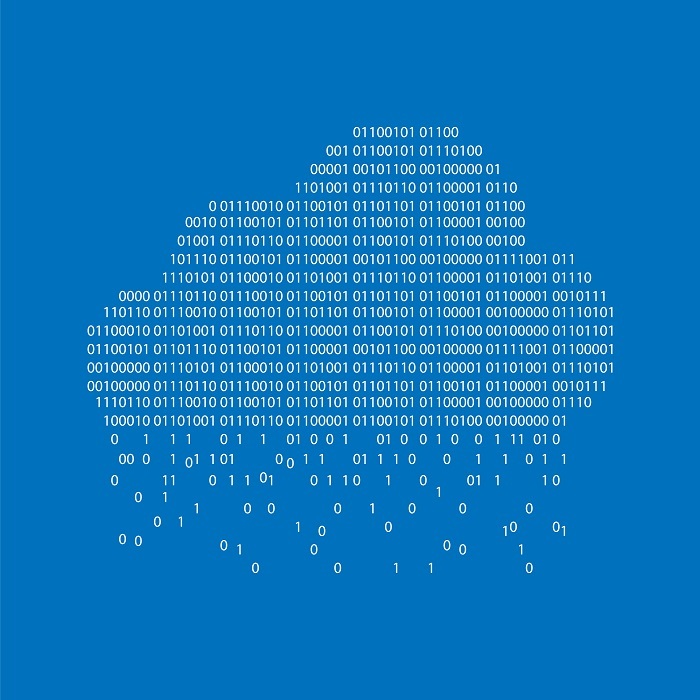 Aurora supports replication to up to five additional regions with logical replication. It is important to note that, depending on the workload, logical replication across regions can be notably susceptible to replication lag. One of the many announcements to come out of re:Invent 2018 is a product called Aurora Global Database. This is Aurora’s implementation of cross-region physical replication. Amazon’s published details on the solution indicate that it is storage level replication implemented on dedicated cross-region infrastructure with sub-second latency. In general terms, the idea behind a cross-region architecture is that the second region could be an exact duplicate of the primary region. This means that the primary region can have up to 15 Aurora Replicas and the secondary region can also have up to 15 Aurora Replicas. There is one database instance in the secondary region in the role of writer for that region. This instance can be configured to take over as the master for both regions in the case of a regional failure. In this scenario the secondary region becomes primary, and the writer in that region becomes the primary database writer. This configuration provides protection in the case of a regional disaster. It’s going to take some time to test this, but at the moment this architecture appears to provide the most comprehensive combination of Durability, HA, and DR. The trade-offs have yet to be thoroughly explored. Amazon is in the process of building out a new capability called Aurora Multi-Master. Currently, this feature is in preview phase and has not been released for general availability. While there were a lot of talks at re:Invent 2018 which highlighted some of the components of this feature, there is still no affirmative date for release. Early analysis points to the feature being localized to the AZ. It is not known if cross-region Multi-Master will be supported, but it seems unlikely. As a post re:Invent takeaway, what I learned was that there is an Aurora configuration to fit almost any workload that requires strong performance behind it. Not all heavy workloads also demand HA and DR. If this describes one of your workloads, then there is an Aurora configuration that fits your needs. On the flip side, it is also important to remember that while data durability is an intrinsic quality of Aurora, HA and DR are not. These are completely configurable. This means that the Aurora architect in your organization must put thought and due diligence into the way they design your Aurora deployment. While we all need to be conscious of costs, don’t let cost consciousness become a blinder to reality. Just because your environment is running in Aurora does not mean you automatically have HA and DR for your database. In Aurora, HA and DR are configuration options, and just like the on-premise world, viable HA and DR have additional costs associated with them. One of the most exciting features Amazon Aurora Serverless brings to the table is its ability to go to sleep (pause) when idle. This is a fantastic feature for development and test environments. You get access to a powerful database to run tests quickly, but it goes easy on your wallet as you only pay for storage when the instance is paused. For this feature to work, however, inactivity has to be complete. If you have so much as a single query or even maintain an idle open connection, Amazon Aurora Serverless will not be able to pause. This means, for example, that pretty much any monitoring you may have enabled, including our own Percona Monitoring and Management (PMM) will prevent the instance from pausing. It would be great if Amazon RDS Aurora Serverless would allow us to specify user accounts to ignore, or additional service endpoints which should not prevent it from pausing, but currently you need to get by without such monitoring and diagnostic tools, or else enable them only for duration of the test run. If you’re using Amazon Aurora Serverless to back very low traffic applications, you might consider disabling the automatic pause function, since waking up currently takes quite a while. Otherwise, your users should be prepared for a 30+ seconds wait while Amazon Aurora Serverless activates. Having such a high time to activate means you need to be mindful of timeout configuration in your test/dev scripts so you do not have to deal with sporadic failures. Or you can also use something like the mysqladmin ping command to activate the instance before your test run. I measured the time it takes to run a trivial query (SELECT 1) after the instance goes to sleep. You’ll see I manually scaled the Amazon RDS Aurora Serverless instance to a desired capacity in ACU (Aurora Compute Units), and then had the script wait for six minutes to allow for pause to happen before running the query. The test was performed 12 times and the Min/Max/Avg times of these test runs for different settings of ACU are presented above. You can see there is some variation between min and max times. I would expect to have even higher outliers, so plan for an activation time of more than a minute as a worst case scenario. Also note that there is an interesting difference in the activation time between instance sizes. While in my tests the smallest possible size (2 ACU) consistently took longer to activate compared to the medium size (8 ACU), the even bigger size (64 ACU) was the slowest of all. So make no assumptions about how long it would take for instance of given size to wake up with your workload, but rather test it if it is important consideration for you. Finally, you may wonder how such Amazon Aurora Serverless pausing plays with Amazon Aurora Serverless Autoscaling ? In my tests, I observed that resume always restores the instance size to the same ACU as it was before it was paused. However, this is where pausing configuration matters a great deal. According to this document, Amazon Aurora Serverless will not scale down more frequently than once per 900 seconds. While the document does not clarify over what period of time the conditions initiating scale down – cpu usage, connection usage etc – have to be met for scale down to be triggered, I can see that if the instance is idle for five minutes the scale down is not performed – it is just put to sleep. This also shows that when the load is re-applied at about 13:47, it recovers to the last number of ACU it had before the pause. This means that a pause time of more than 15 minutes makes the pause behavior substantially different to the default. Amazon Aurora Serverless automatic pause is a great for test/dev environments. Resume time is relatively long, can reach as much as one minute. Consider disabling automatic pausing for low traffic production applications, or at least let your users know they need to wait when they wake up the application. Pause and Resume behavior is different in practice for a pause timeout of more than 15 minutes. Sticking to the default 5 minutes is recommended unless you really know what you’re doing. The closing of a year lends itself to looking back. And making lists. With the Percona Database Performance Blog, Percona staff and leadership work hard to provide the open source community with insights, technical support, predictions and metrics around multiple open source database software technologies. We’ve had nearly 4 million visits to the blog in 2018: thank you! We look forward to providing you with even better articles, news and information in 2019. 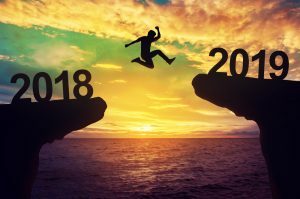 As 2018 moves into 2019, let’s take a quick look back at some of the most popular posts on the blog this year. ZFS has many very interesting features, but I am a bit tired of hearing negative statements on ZFS performance. It feels a bit like people are telling me “Why do you use InnoDB? I have read that MyISAM is faster.” I found the comparison of InnoDB vs. MyISAM quite interesting, and I’ll use it in this post. In this post we will review the most important Linux settings to adjust for performance tuning and optimization of a MySQL database server. We’ll note how some of the Linux parameter settings used OS tuning may vary according to different system types: physical, virtual or cloud. As the MyRocks storage engine (based on the RocksDB key-value store http://rocksdb.org ) is now available as part of Percona Server for MySQL 5.7, I wanted to take a look at how it performs on a relatively high-end server and SSD storage. The ability to restore MySQL logical backups is a significant part of disaster recovery procedures. It’s a last line of defense. MySQL stored procedures, functions and triggers are tempting constructs for application developers. However, as I discovered, there can be an impact on database performance when using MySQL stored routines. Not being entirely sure of what I was seeing during a customer visit, I set out to create some simple tests to measure the impact of triggers on database performance. The outcome might surprise you. Ever since AMD released their EPYC CPU for servers I wanted to test it, but I did not have the opportunity until recently, when Packet.net started offering bare metal servers for a reasonable price. So I started a couple of instances to test Percona Server for MySQL under this CPU. In this benchmark, I discovered some interesting discrepancies in performance between AMD and Intel CPUs when running under systemd. Out of the box, the default PostgreSQL configuration is not tuned for any particular workload. Default values are set to ensure that PostgreSQL runs everywhere, with the least resources it can consume and so that it doesn’t cause any vulnerabilities. It is primarily the responsibility of the database administrator or developer to tune PostgreSQL according to their system’s workload. In this blog, we will establish basic guidelines for setting PostgreSQL database parameters to improve database performance according to workload. If you are using large EBS GP2 volumes for MySQL (i.e. 10TB+) on AWS EC2, you can increase performance and save a significant amount of money by moving to local SSD (NVMe) instance storage. Interested? Then read on for a more detailed examination of how to achieve cost-benefits and increase performance from this implementation. In this blog post, I’ll provide an explanation why you should avoid using the CREATE TABLE AS SELECT statement. The SQL statement “create table <table_name> as select …” is used to create a normal or temporary table and materialize the result of the select. Some applications use this construct to create a copy of the table. This is one statement that will do all the work, so you do not need to create a table structure or use another statement to copy the structure. 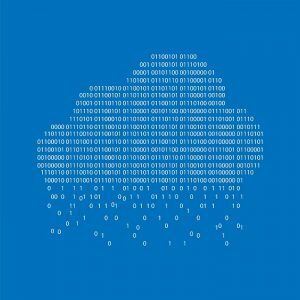 Is Serverless Just a New Word for Cloud-Based? Have a great end of the year celebration, and we look forward to providing more great blog posts in 2019. When I attended AWS Re:Invent 2018, I saw there was a lot of attention from both customers and the AWS team on Amazon RDS Aurora Serverless. So I decided to take a deeper look at this technology, and write a series of blog posts on this topic. In this first post of the series, you will learn about Amazon Aurora Serverless basics and use cases. In later posts, I will share benchmark results and in depth realization results. Once you set up such an instance it will automatically scale between its minimum and maximum capacity points. You also will be able to scale it manually if you like. One of the most interesting Aurora Serverless properties in my opinion is its ability to go into pause if it stays idle for specified period of time. This feature can save a lot of money for test/dev environment where load can be intermittent. Be careful, though, using this for production size databases as waking up is far from instant. I’ve seen cases of it taking over 30 seconds in my experiments. Another thing which may surprise you about Amazon Aurora Serverless, at the time of this writing, is that it is not very well coordinated with other Amazon RDS Aurora products – it is only available as a MySQL 5.6 based edition and is not compatible with recent parallel query innovations either as it comes with list of other significant limitations. I’m sure Amazon will resolve these in due course, but for now you need to be aware of them. A simple way to think about it is as follows: Amazon Aurora Serverless is a way to deploy Amazon Aurora so it scales automatically with load; can automatically pause when there is no load; and resume automatically when requests come in. When I think about Serverless Computing I think about about elastic scalability across multiple servers and resource usage based pricing. DynamoDB, another Database which is advertised as Serverless by Amazon, fits those criteria while Amazon Aurora Serverless does not. With Amazon Aurora Serverless, for better or for worse, you’re still living in the “classical” instance word. Aurora Capacity Units (ACUs) are pretty much CPU and Memory Capacity. You still need to understand how many database connections you are allowed to have. You still need to monitor your CPU usage on the instance to understand when auto scaling will happen. I’m excited about the new possibilities Amazon Aurora Serveless offers. As long as you do not expect magic and understand this is one of the newest products in the Amazon Aurora family, you surely should give it a try for applications which fit. 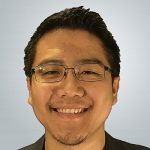 If you’re hungry for more information about Amazon Aurora Serverless and can’t wait for the next articles in this series, this article by Jeremy Daly contains a lot of great information. Percona is a Bronze sponsor of AWS re:Invent in 2018 and will be there for the whole show! Drop by booth 1605 in The Venetian Expo Hall to discuss how Percona’s unbiased open source databse experts can help you with your cloud database and DBaaS deployments! Our CEO, Peter Zaitsev will be presenting a keynote called MySQL High Availability and Disaster Recovery at AWS re:Invent! Check out our case study with Passportal on how Percona DBaaS expertise help guarantee uptime for their AWS RDS environment. to regularly inspect the differences between the runtime config on each cluster and identify or resolve differences. to be able to use tools like gh-ost in these types of situations. In our previous article, we discussed the importance of continuous query performance analysis, especially in Amazon Aurora where there is less diagnostic visibility compared to running on EC2 or on-premise. Aside from uptime though, we need a lot more from our data, and we definitely cannot isolate it in Aurora. Next on our checklist is that at one point or another, we will need to use asynchronous replication. Amazon Aurora has an excellent reputation for absorbing intense amounts of writes, and for many cases where you need an asynchronous replica, any replica can have potential issues catching up. Critical workloads and datasets cannot rely on a single copy of their data. With Amazon Aurora, predictable performance means avoiding mixing workloads within your production cluster. While read heavy workloads might fit easily into read-replicas, reporting or analytics workloads might not be a good fit to execute on your main cluster where read-what-you-write profiles are normally found. You can either delegate this on a separate asynchronous replica as separate Amazon Aurora cluster, or another that runs on an EC2 instance (as an example). This is also true if, say, your analytics or reporting workload generate a significant amount of disk IOPs. Amazon Aurora IO bills operations per million. You might save some money running disk-heavy analytics operations on a replica running on an i3 instance with a local NVMe for example. Similarly, running an async replica on an EC2 instance or on-premise allows you to take your own independent backups, or just an extra level of redundancy. It is a known fact that MySQL asynchronous replication performance is subject to some limitations. The biggest one is that, by default, it is single-threaded. MySQL 5.6 introduced multi-threaded replication at one database per thread. This did not apply to the majority of use cases, as workloads vary per database and therefore create an imbalance. With MySQL 5.7 (Aurora 2.0), there have been additional improvements such as an alternative algorithm in parallelizing thread execution that depends on certain behaviors regarding how acting primary servers write binary log entries. With that said, certain multi-threaded replication variables (transaction_write_set_extraction) require that the binlog format is set to ROW. This might sound counter-intuitive because the ROW binlog format actually can increase the replication workload. While ROW format reduces the ambiguity from potentially non-deterministic statements that could cause a replica to drift and become inconsistent, critical operations (schema changes) and optimizations (MTS) requires that you use ROW binlog format. can reduce network churn. In the deep end, reducing dataset hotspots, ensuring tables have PRIMARY KEYs and embracing multi-threaded optimization can also go a long way. While running certain read-heavy queries on an async replica, or ensuring you have access to physical datafiles are common use cases, being able to switch to another location (region) or just simply another cluster might also be necessary for some instances. Adding or dropping a column/index on a large table can be achieved with either pt-online-schema-change or gh-ost. But for cases where time is a constraint, applying schema changes on an asynchronous cluster and switching to that sometimes pays for itself. Configuration changes or upgrades that require a cluster restart can take seconds or even minutes. Wouldn’t it be nice if you already had a cluster with all these changes ready to take over at a moment’s notice? Or even fail back to the original if there was an unforeseen issue? Stay “tuned” for part three. Meanwhile, we’d like to hear your success stories in Amazon Aurora in the comments below!